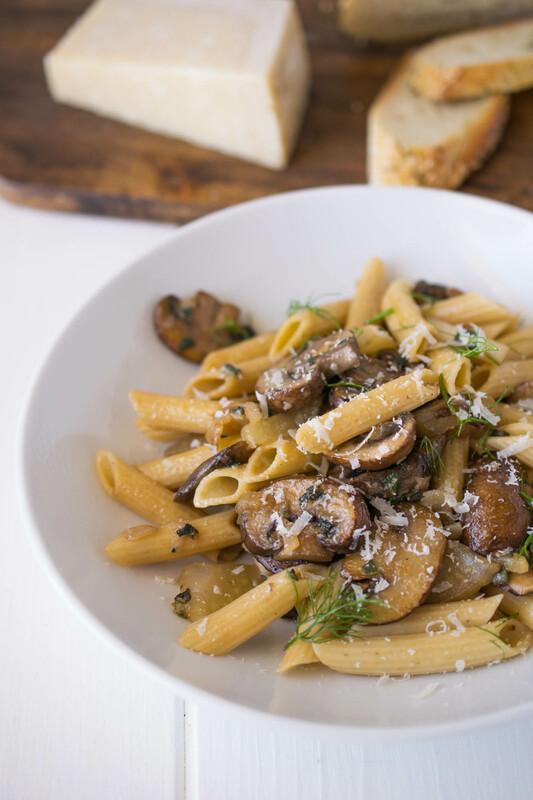 Easy Mushroom, Fennel & Sage Pasta is an easy dish that is on the table in about 20 minutes. Perfect for those busy weeknights and also makes delicious leftovers for lunch the next day. Everyone needs a quick and easy dinner and pasta is as easy as it gets. 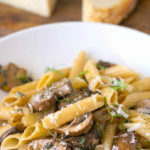 This easy pasta dish incorporates earthy mushrooms and seasonal ingredients like fennel and sage for a flavorful meal. If you’ve never tried fennel before, it is a crunchy vegetable which is a member of the carrot family. When raw it has a slightly sweet anise/licorice flavor and when cooked like in this recipe, becomes even sweeter and is so good in this dish. This is a vegetarian dish but you will not miss the meat because the mushrooms have a wonderful, meaty chew to them. This is one of my favorite vegetarian pasta dishes. Anytime you add mushrooms to a meat-free meal, you still get the meaty bite from the mushrooms and find that you don’t even miss the meat. I have to have a good crusty bread with my pasta. I love this sesame loaf that I get at my grocery store (pic below). Drizzled with olive oil and broiled until golden brown, I could make a meal of it with a chunk of Parmigiano Reggiano. 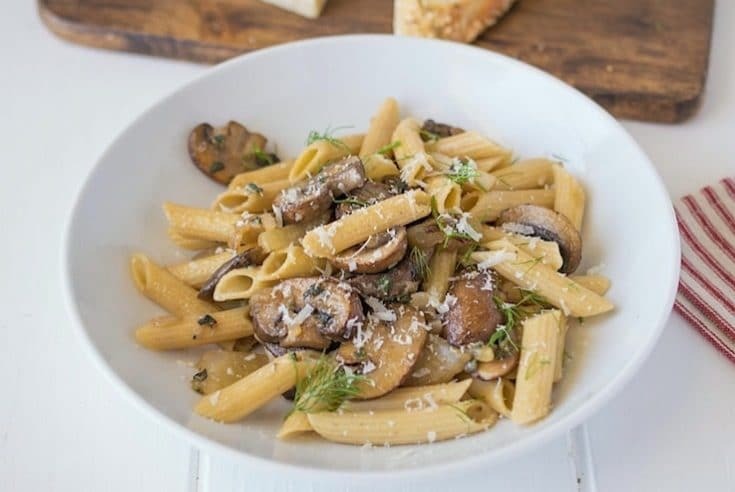 If you’ve tried this Easy Mushroom, Fennel & Sage Pasta or any other recipe on the blog then don’t forget to rate the recipe and let me know how it turned out in the comments below. I love to hear from my readers! 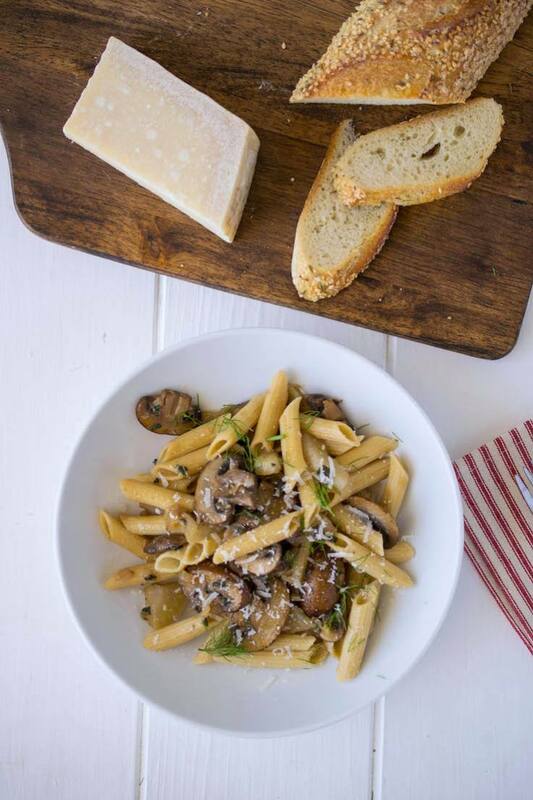 Meaty mushrooms are cooked with shallots, fennel and sage then tossed with pasta for a quick, meal free meal. Meanwhile to a large skillet, add olive oil and butter over medium heat. Add the mushrooms and cook until they brown, about 10 minutes. Add the shallots and fennel to the butter and cook until they start to soften, about 5-7 minutes. Stir in the garlic and cook for 1 minute then add the sage and cook for another minute until fragrant. Add the salt and pepper and stir. Add the vegetable stock and mix well, simmer until slightly reduced, about 3 minutes. Stir in the 1/2 cup parmesan cheese. Drain the pasta and mix the cooked pasta into to the mushrooms and mix well. Serve garnished with fresh fennel greens and 1/4 cup Parmesan. Totally approve of these sorts of pasta meals, Janette! I love that you’ve kept yours really simple, just adding parmesan to combine with the stock and make a sauce. Janette, this is an easy but very tasteful pasta recipe. I never thought to use them with fennel though, I bet it tastes wonderful! Thank you for an easy weeknight meal! 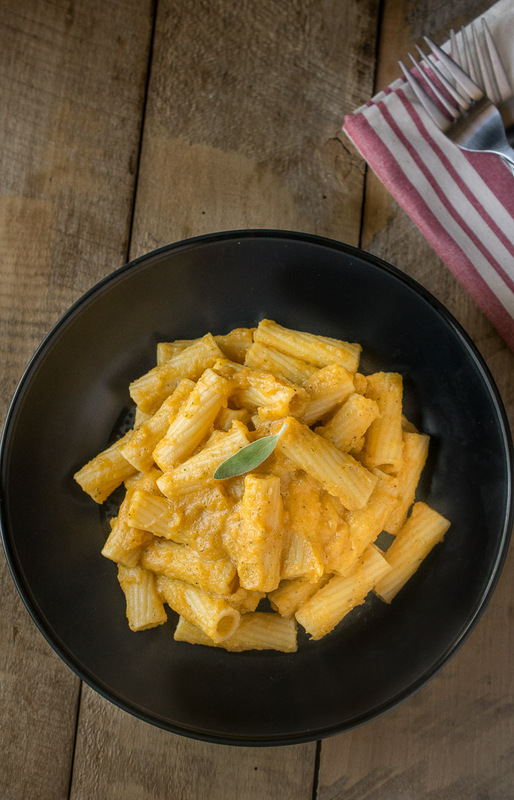 Nothing beats a hearty bowl of pasta with such yummy ingredients. This looks so crazy good! I LOVE mushrooms! This is a must make. This sounds absolutely delicious, healthy and easy to make. Perfect!! This looks wonderful! 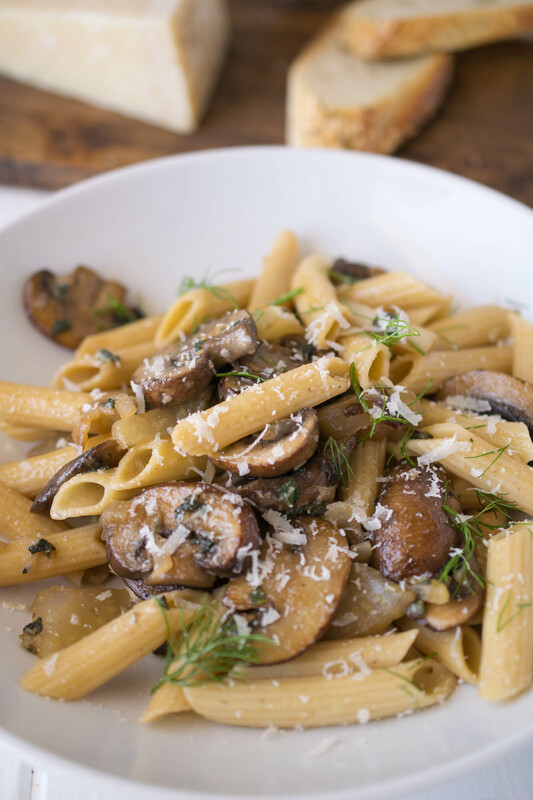 Of course, how could you go wrong with pasta and mushrooms!! !